As technology advances devices get smaller and the speed requirements of data transmission on circuit boards increases. 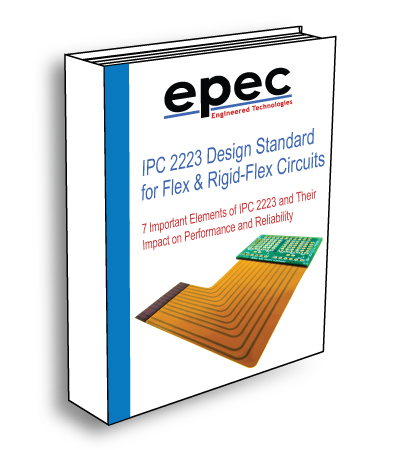 Every flexible PCB is designed to perform a function inside an allotted space, but they also need to be manufacturable, need to be held to strict mechanical tolerances, and need to be cost effective. With component sizing getting smaller every year, it allows very small flexible PCBs to include significant functionality along with being a passive component to provide connectivity in certain applications. Microcircuits require very fine line and spaces which requires specialized etching equipment. The following table outlines our general capabilities for flexible microcircuits. However, every application is different so please contact us with your design questions so that we can review your application parameters. Epec is a leading experienced miniature printed circuit board developer and manufacturer with an eye on industry tolerances and customer service. We offer a full design and manufacturing services that can quickly adjust to meet any high or low volume demands you have. We are here to help you with all your rigid-flex PCB needs. Register today and start to quote and order your flex circuits online, 24/7.